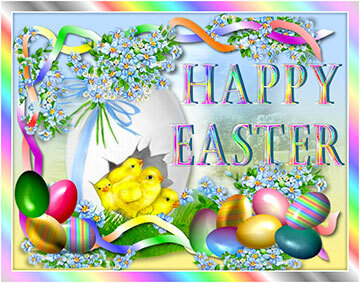 Easter graphics for your personal and non profit web pages. 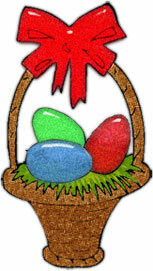 Easter clipart of eggs, baskets, chicks, crosses, bunnies, flowers and more. Easter chicks with basket and colored eggs. Happy Easter with eggs and flowers. Easter chick with colored eggs and Easter bonnet. code for Easter eggs and chick. A little crazy Easter bunny. 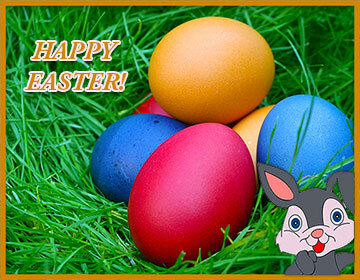 Happy Easter with bunny, flowers and animation. Easter eggs well hidden in the grass. Could that be the Easter Bunny? Animated Easter eggs having fun. Easter bunny with Easter basket. A bunny with flowers and glitter animation. Easter with a hopping bunny. Happy Easter with chicks, eggs and lots of flowers. 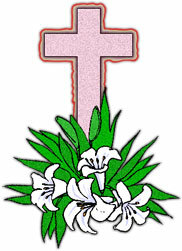 Cross with Easter Lilies in front. Christian Cross and Easter Lilies. 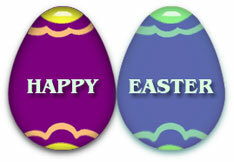 Happy Easter with egg and glitter animation. Happy Easter Bunny and basket in frame. Cute bunny with eggs and glitter animation. Easter basket with bunny animation. 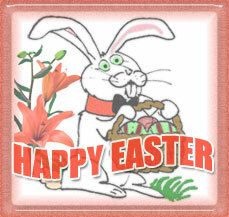 Bunny with flowers and Easter basket plus animation. Bunnies in a basket with Easter eggs. Easter basket with red bow and Easter eggs. Happy Easter on glass eggs. Glass eggs - HTML code for websites. Bunny, eggs and flowers on a transparent background. Easter bunny in basket with chicks and Easter eggs.